Kathryn Bertine has described yesterday’s announcement by ASO of a new women’s event called La Course as being an important intermediate step towards a Tour de France race for women. The Le Tour Entier co-founder, who has raced professionally for several years and who is behind the new Half the Road documentary, combined with fellow Le Tour Entier members Marianne Vos, Emma Pooley and Chrissie Wellington to build a groundswell of support for a women’s Tour. A petition has been signed by almost 100,000 people and this interest plus the campaigning by Vos, Pooley and other key members of the women’s peloton – as well as the UCI’s efforts to develop this area of the sport – have all been catalysts which played a part in the new event. ASO announced La Course yesterday, saying that the new race would see some of the world’s top female competitors racing on the streets of Paris on the same day that the Tour de France concludes there. The riders will sprint for victory on the Champs-Elysées, drawing on the same huge crowds that the Tour will enjoy, and will be broadcast on France Télévisions and Eurosport International. It has been hailed as a big step forward for the sport by many, including UCI president Brian Cookson. Bertine views it as the next stage in bringing parity to the sport. “We see this as a stepping stone toward a women's Tour,” she told VeloNation, making clear that the long term ambition remains the same. “With the 2014 Tour de France less than six months away, we understand time is an issue and we're grateful for the opportunity to make history this year with a one-day event. There have been women’s Tours in the past but these were separate events rather than ASO creations, and had little if any link with the hugely popular men’s event. The latter enjoys massive support and coverage, and part of the reasoning behind the Le Tour Entier project is to tap into that interest and to use it as a platform to grow the women’s side of the sport. Bertine is clear that the criterium-style event which will be run in this first year is a major boost. “We’re all thrilled about the news of La Course. It's not an easy task to make changes to tradition, but ASO has been terrific. We see this as a most positive step, not just for women's cycling but for all of cycling,” she said. The success of this first year will be of prime importance in determining how seriously ASO and others take the project long-term. If the race can secure the support and imagination of the public, the media and backers, the French company is more likely to work on plans for a bigger event. Bertine outlines what she believes are the most important things in year one. “Securing media and sponsorship will be the key factors, and of course, the fans of cycling can play an enormous role by supporting this year's La Course race. The 2013 world number one Emma Johansson echoed that in speaking to EuroSport. “It is a fantastic initiative and it feels a bit like they have listened to our wishes and want to do a test to see how much interest there is,” she stated. The drive to build interest will be furthered by the new Half the Road film, which made its debut in recent days and details women’s cycling and its efforts to grow. Bertine said that she was delighted with the response and looks forward to seeing reactions across the US and beyond. “We sold out a 500 seat theatre in Tucson, Arizona on Wednesday night, and we had to turn people away at the door. The reaction to Half the Road was, as a filmmaker, everything I ever hoped for in a premiere,” she told VeloNation. The film has just been acquired by a US distributor. Bertine said that the next step is to work to get it into theatres and film festivals over the next four to five months, after which it will be made available via downloads and DVDS. 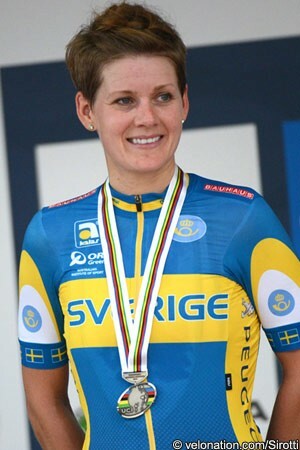 On March 1st she said there would be a screening at the Richmond International Film Festival, thus tying in with the location for the 2015 world road race championships. Then on Sunday April 6th a UK premiere will be shown at the Sheffield Adventure Film Festival. Further details will become available on the www.halftheroad.com site and also at the @halftheroad Twitter feed.